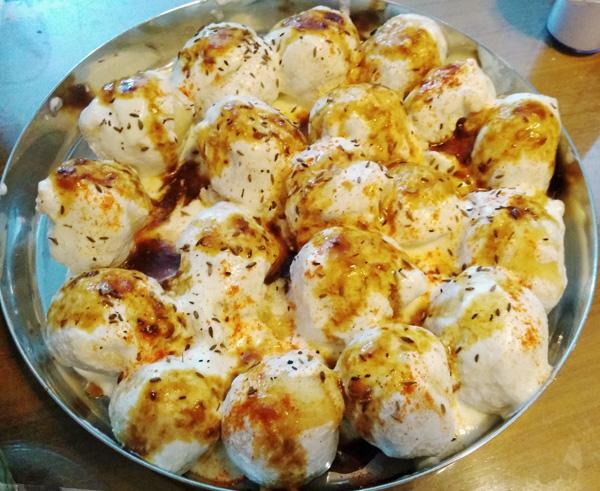 Dahi pakoras are a part of a group of snacks called Chat or Chaat. Traditionally, they are deep fried and served dipped in a yoghurt sauce, with a sprinkling of spices, Green Mango Chutney and Tamarind Chutney. In our family, we tend to eat these with tamarind chutney only. For Holi, the Indian festival of colours, pakoras are soaked in Kanji ka Pani, instead of yoghurt sauce. Also see Chat Selection. Makes 20-25 (amount will vary depending on the size you make). *Some people make them with mung or urad dal alone, or a 50/50 mix or with urad dal alone. 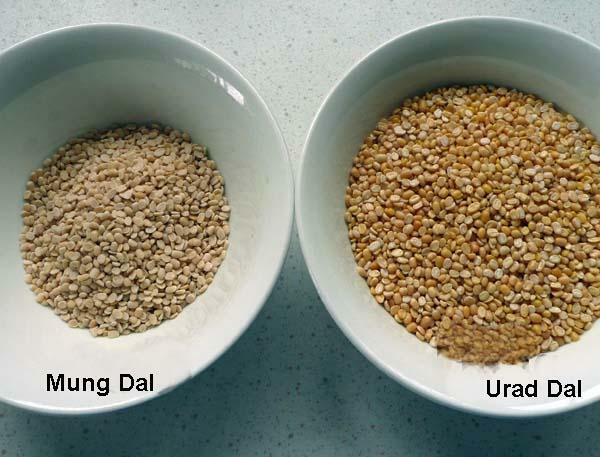 Wash and soak urad and mung dal overnight or for 4-5 hours. Grind both dals together in a liquidizer, with enough water to make a thick batter. It should be coarsely ground, to a consistency of coarse semolina. 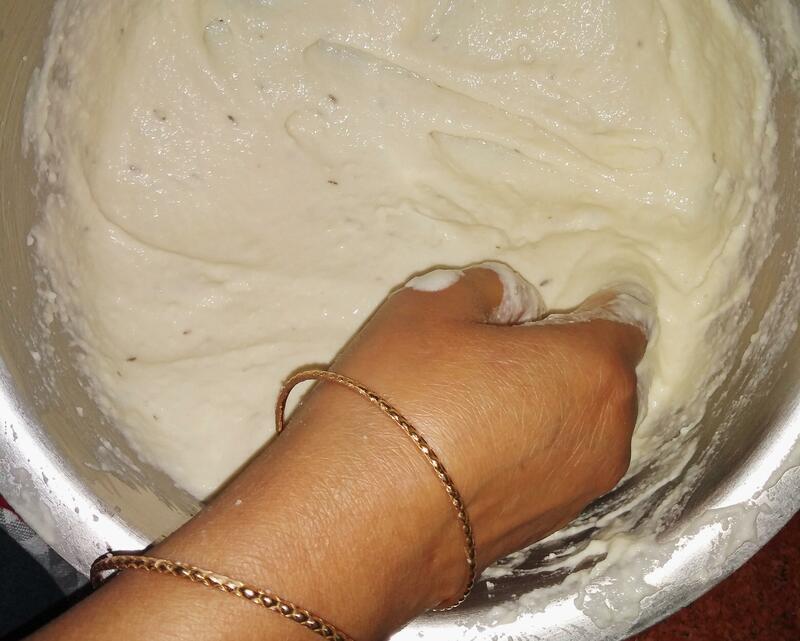 Add all other ingredients for pakora and beat well until the batter looks almost white. 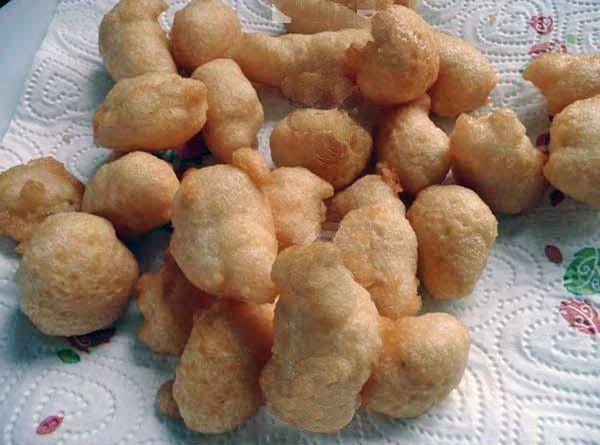 It is the trapped air in the batter that makes them light and fluffy. You know it is done when you put a dollop of the batter in a bowl of water and it floats to the top. You can also add baking powder as a raising agent, but this is not usually required in a well beaten batter. 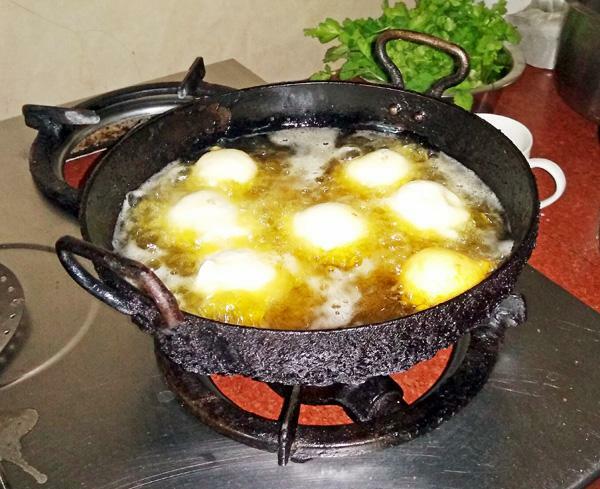 Heat oil in a wok or fryer. The oil is ready, when a drop of batter sizzles and rises to the top. Smoking oil is too hot. 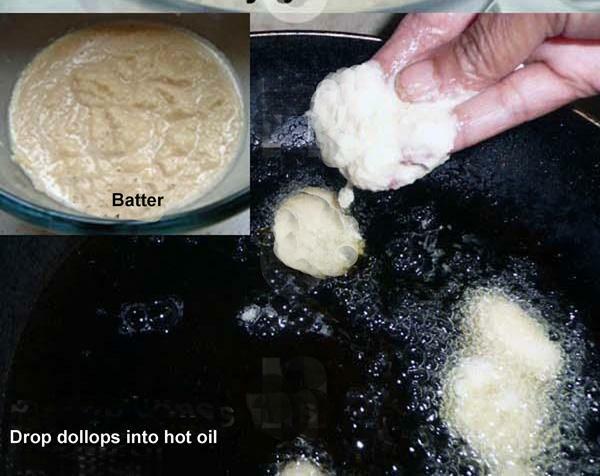 Drop dollops of batter into the oil, either using a teaspoon or your fingers. Size of pakoras is your choice, but I would make roughly 4 cm in diameter. Fry gently on medium fire, turning over frequently until lightly golden brown. Keep aside on an absorbent paper. They can be frozen at this stage and used at leisure. Beat the yoghurt and all yoghurt ingredients lightly. Soak 2-3 pakoras per person in warm, salted (1 tsp. salt per litre of water) water for a few minutes. Do not soak pakoras in yoghurt too long in advance of serving or they will become very friable and break when served. Put a few spoonfuls of prepared yoghurt on a platter as a base. 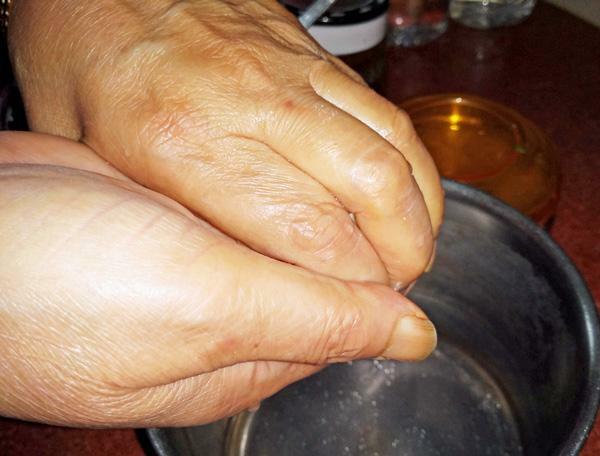 Squeeze each pakora gently between the palms, to get rid of the water and then dip them in yoghurt, ensuring that each pakora is nicely coated with yoghurt on all sides. Place them on to the yoghurt lined platter, side by side, in a single layer and not in a pile on top of each other. This avoids breaking them up during serving. Spoon remaining yoghurt generously over the pakoras, to ensure that all are covered with yoghurt thoroughly. Sprinkle a pinch of chilli powder and roast cumin powder as garnish. You can also garnish with chopped coriander if you wish. 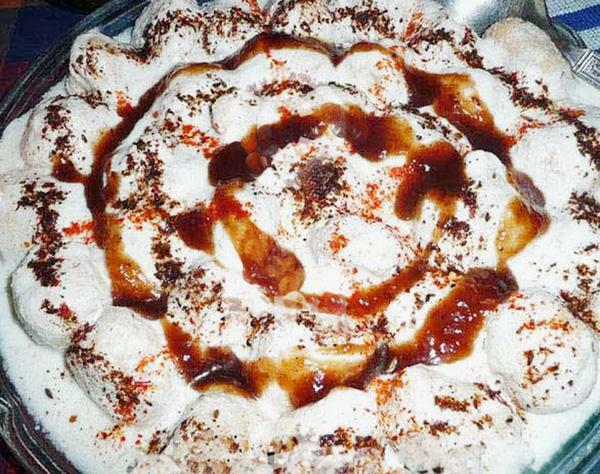 Serve chilled with Tamarind Chutney and Green Mango Chutney. Pakoras can be served as a snack, without the yoghurt. Serve hot and crisp, with green coriander chutney. When used as snacks, add chopped green chillies, chopped onions and chopped coriander leaves to the batter. 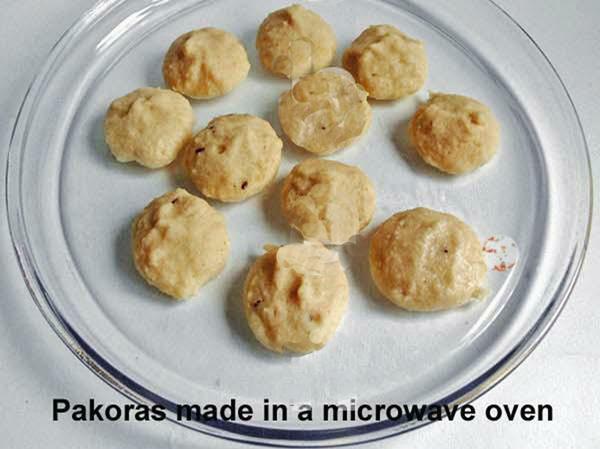 Although deep fried vadas taste best, they can be made in microwave, without any need to fry. Add 1/2 tsp. oil to the batter. Place blobs of batter on a plate, cover and microwave on 800 for 3 minutes.